SFV-CAMFT - "Working with the Self-Injury Hidden in Your Practice: Resources for Clinicians"
"Working with the Self-Injury Hidden in Your Practice: Resources for Clinicians"
Self-injury is a special area of suffering, deserving of its own careful treatment. Learn to spot the warning signs in your own practice, either with clients or with loved ones, as well as how to distinguish this behavior from suicidal gestures. Discover new ways to begin a difficult conversation in a safe, nurturing, and non-threatening way. Angela Kahn, LMFT is the Founder and Director of the Kahn Institute for Self-Injury in Los Angeles. She has worked with the self-injury population for over a decade, and has been invited to speak at local events, national conferences, universities, and was a recent guest on the Talking Therapy podcast. 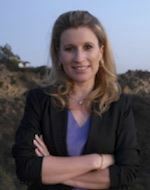 She is adjunct faculty at California State University Northridge and Antioch University Los Angeles, and is the current President of the California Division of AAMFT.